Located in Alpharetta, Blackburn & Adair, L.L.C., is a Georgia law firm handling various real estate and estate planning matters. Our law firm approaches each client's legal needs in a straightforward manner. We strive for open communication with our clients and seek to address matters quickly, provide direct guidance in potentially difficult circumstances and encourage clients to be involved with any decisions that need to be made relevant to their legal matter. 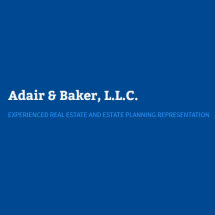 For those with real estate needs, we confidently handle both residential and commercial real estate matters. Our areas of focus are geared toward residential closings, reviewing and negotiating sales contracts and all elements of buying, selling and leasing commercial real estate property. For those with estate planning needs, we offer an array of services. Wills, trusts, advanced directives, financial powers of attorney and more - if you need a will or other estate planning services, we can meet your objectives. Blackburn & Adair, L.L.C. - Georgia's law firm - is built upon the experience of Robert G. "Bob" Blackburn, who now serves of counsel to the firm. John L. Adair, Jr., is active in the Real Estate and Corporate Counsel Sections of the State Bar of Georgia. Dedicated associate attorneys Alden Gish Cheij and Nicolas Baker round out our highly experienced and dedicated legal team. Our clients' needs are varied and often intersect, as real estate and estate planning tend to do. We look forward to helping you with your needs and arriving at solid, successful resolutions. Blackburn, Walther, Sloan & Adair, L.L.C.